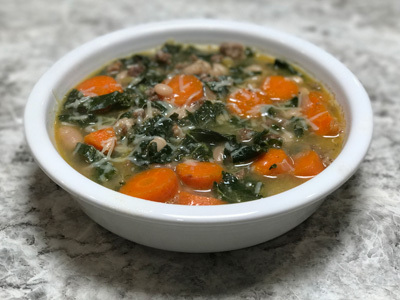 This week’s recipes include two soups which fit perfectly into the cold, rainy weather we’ve been having. We included a light spring soup which uses many spring herbs, the Dutch Herb Soup. A variation of this recipe is suggested to originate as early as the mid 17th century. The recipe we included is a based on Christiane Muusers recipe translation from the original cookbook Keukenboek by Henriette Davidis from 1868. The original recipe calls for potato dumplings, which we swapped for plain potatoes due to time constraints, but we would encourage those who are slightly more ambitious to make potato dumplings or replace the potatoes with gnocchi. Add ½ lb of white beans to stockpot and cover with 2 inches of water. Bring to a boil. Once simmering, remove from heat and let stand, uncovered, for 1 hour. Then drain and rinse beans. Roughly chop 1 medium yellow onion and saute in 2 tbsp of olive oil over moderately low heat in 8 quart stockpot. Cook until softened, about 4-5 minutes, then add 2 cloves of garlic and cook for 1 minute. Add beans, 1 quart of chicken stock, and 1 quart of water, as well as salt, pepper, and a bay leaf. Simmer, uncovered, until the beans are just tender, about 50 minutes. Brown sausage while soup is simmering in heavy skillet over moderate heat, stirring, then drain sausage onto paper towel or place in a bowl. Add carrots, sliced crosswise into ½-inch pieces, to soup and simmer for 10 minutes. Then stir in kale, 1 tbsp each of chopped winter savory, oregano, and thyme. Also add ½ lb of sausage. Cook uncovered for 12-15 minutes until kale is tender, stirring occasionally. Season with additional salt and pepper to taste. Serve with shredded Parmigiano-Reggiano. Rough chop ½ of red oakleaf lettuce heads. 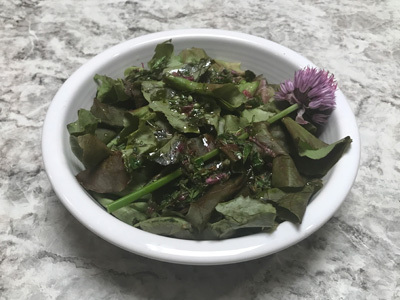 Drizzle up to ¼ cup of lemon-mint vinaigrette on top (recipe below). Vinaigrette- Remove mountain mint leaves from the stem and finely chop 2 tbsp. 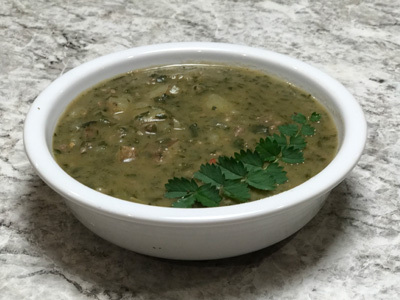 Mix the chopped mint with 2 tbsp of lemon juice, or the juice of 1 squeezed lemon, ½ tbsp of Dijon mustard, ½ tsp of sugar, ½ clove garlic, minced, 2 tbsp of extra-virgin olive oil, and ⅛ tsp salt, and freshly ground pepper to taste. *This vinaigrette also works well on starchier salads, such as those with potato, or grains, such as couscous. Brown 2 tbsp of butter in a large pan, then stir in ⅓ cup of flour. Keep stirring for several minutes on very low heat until the roux is golden. 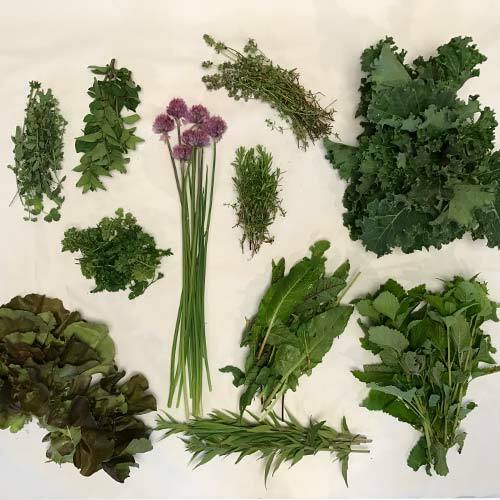 Then add 1 bunch of sorrel greens, 1 bunch of salad burnet, ¼ bunch of kale, 3 tbsp of chives. Stir until the greens have lost water and shrunk, and then slowly add 1 quart of chicken stock, 1 tsp of salt, and ½ tsp of ground black pepper. Keep stirring to prevent from scorching. Puree the soup in a blender or with an emersion blender. Return soup to stockpot. Chop 2 russet potatoes into ½-inch cubes, then add to a stock pot. Let soup simmer for 15 more minutes, and then add ¼ lb of browned sausage. Add water is consistency is too thick. Add 3 tbsp chopped parsley just before serving. Rough chop ½ of red oakleaf lettuce heads. 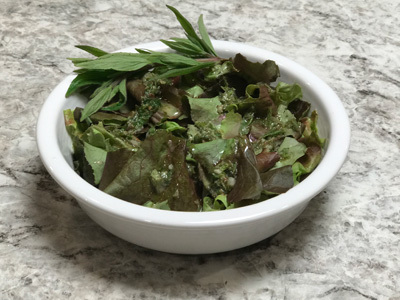 Drizzle up to ¼ cup of savory herb vinaigrette on top (recipe below). Vinaigrette- Chop ⅔ tbsp each of winter savory, oregano, thyme, and chive leaves or seed head. Take 2 tbsp of herb mixture and add 2 tbsp of apple cider vinegar, ½ cup of olive oil, ½ tsp salt, and ⅛ tsp pepper. Rinse lemon balm and remove heavily damaged leaves. Mince 2 cloves of garlic in food processor or blender. Add 2 cups of lemon balm leaves, stems removed, to blender. Add ½ cup of walnuts, and ½ tsp of salt. Process until finely chopped but still chunky. With the machine going, slowly pour in ½ cup of olive oil. Once blended add 3 oz of Parmigiano-Reggiano, and process briefly to mix. Add salt and pepper as needed. Cook 6-8 oz of egg noodles according to packaging. 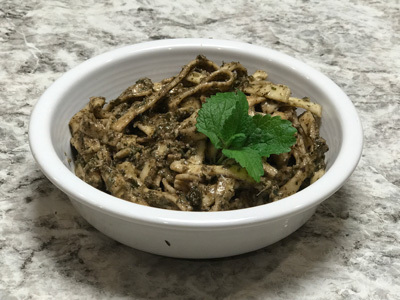 To serve, stir pesto into hot cooked pasta.